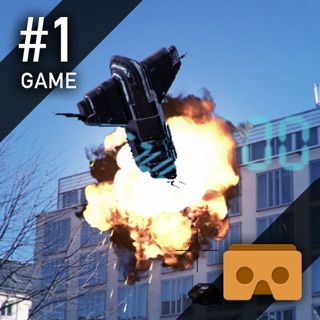 WAR of the AI is the most amazing AR shooter game! AI (artificial intelligence) has taken over the world and mankind is being eliminated. Fight for your survival in this augmented reality, first person shooter. It's you versus AI, which higher intelligence will win? - First person augmented reality shooter, in full 360 degree playing field. - Man vs machine sci-fi theme. - Play room scale or a miniaturized version where the robots look like toys. - Experience levels that integrate night vision, rain and snow into your battle. - Physically move to hide behind AR created objects in the room or simply move your phone to hide behind them as an extra layer of protection as you battle. -Stay in the level until the end to see new AI's enter the battle. - Play anywhere, indoors or out. Robots will portal into wherever you decide to engage them. - Built using the Native iOS ARKit which includes automatic ground detection but this game also includes a manual ground detection option. AR has a long way to go but this game gives you a great preview of what’s to come. The graphics look good the way it adds affects to your environment on certain levels is definitely cool but it’s a little repetitive and a battery hog but worth the ultimate price of 5$. Great job by Trailblazing VR. The app is easy to use and the AR effects are great, in my opinion. Definitely worth the download! Love the graphics and intensity in this AR shooter game. The best part is the apps ability to recognize the room space. Thanks for all the amazing guns and robot enemies!! !